Well it's a new month and that means a new challenge at Crafts Galore Encore! The challenge this time is to add your favorite color! Well red is one of my favorite colors to wear so that is what I colored my image! This image, Savannah Belle, is from Kenny K. Downloads. This Steampunk image is so cool and I really enjoyed coloring her! My niece loves Steampunk so she will be getting this card on her birthday! 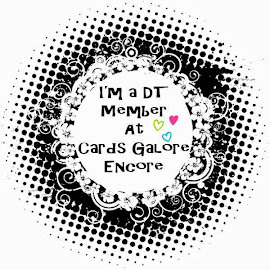 So head on over to Crafts Galore Encore and join in on the fun and you could win two free digis from Kenny G. Downloads! Make it a AWESOME DAY! Fabby inspiration and phenomenal work on this image. You really rocked this and I think I need you to teach me how to use reds. Awesome, colors and layout! Hi Dawn, A fabulous card and love the sassy image. Great colours.